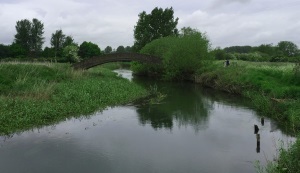 Pannell Discussions » 292 – Walking the Thames Path » Ideas in economics, environment, policy and more. My wife is a keen walker and has been angling to get me to do a long walking holiday with her for years. I finally said I’d do it, provided we avoid hills. She chose the Thames Path, which is not only flat, but also supremely beautiful and really interesting. Day 1 of walking, source to Ashton Keynes. The source is dry, as it usually is. About a kilometre “downstream” there is a gushing spring where the flow really starts. At this stage the Thames is just a narrow stream and the water is crystal-clear. We get stuck in a water-logged field and stung by nettles but still have a lovely first day. In Ashton Keynes the infant Thames runs down the main street, between the road and people’s houses, requiring mini bridges for cars at each house. Day 2, to Cricklade. The path departs from the Thames for a bit and takes us between a series of man-made lakes, which are the result of old gravel mining. I saw an otter in one of them! It is striking that as soon as we reach a paddock where cows have access to the river, the water goes from almost perfectly clear to cloudy. Day 3, to Upper Inglesham. We walk under a busy road (the A419) near Cricklade, but after that it’s very peaceful and mostly remote from people. Apart from locals walking their dogs, we’ve seen only one pair of Thames walkers going upstream so far. Day 4, to Kelmscott. 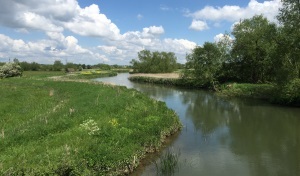 Just before Lechlade-on-Thames the river suddenly widens and becomes navigable to motor boats. 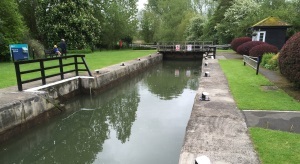 Soon after that, we reach the first of many locks (there are 44 on the Thames). It is fascinating watching how they work. In the village of Kelmscott is the home of William Morris (famous 19th century designer, writer and socialist activist) and we enjoy looking inside his home which is open to the public this day. Day 5, to Newbridge. As on most days, there is a bit of the path that departs from the bank, presumably because of an uncooperative landholder. Chimney Meadows Nature Reserve is lovely. 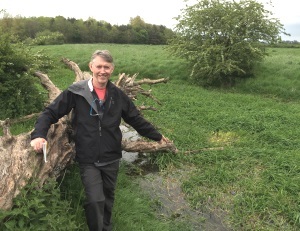 We meet a woman from the Wildlife Trust which manages the Reserve and learn how they manage meadows quite actively to maintain their appearance. We’re seeing increasing numbers of slow-moving power boats, mostly long, narrow canal boats. 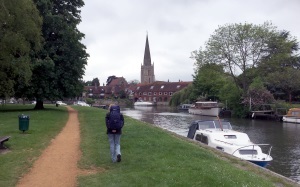 Day 6, to Eynsham. Another day, another beautiful walk. We are amused by the toll bridge charging 5p per car crossing between Swinford and Eynsham. The locals we meet are mostly delightfully enthusiastic about us walking the Thames. We are also struck by how many of them have relatives in Australia – almost all of them, it seems. Day 7, to Oxford. We pass a beautiful wood and the first significant hill close to the river. We start to meet more other walkers. Signs of civilisation increase steadily as we approach Oxford. Close to Oxford the river feels more managed. 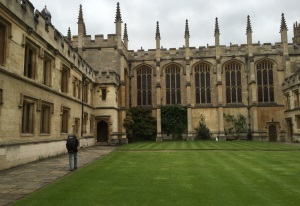 We spend several days in Oxford, resting and exploring all the amazing things. Day 8, to Abington. Beyond Oxford, it quickly becomes beautiful and verdant again. We meet Margaret and Gordon, septuagenarians who are also doing the Thames Walk. I hope we’re as fit as they are at that age. In Abingdon we learn about their eccentric tradition of throwing thousands of buns off the top of the County Hall to the crowds massed below, to celebrate significant royal events. Day 9, to Dorchester-on-Thames. Yesterday we both felt that we could have walked further, but today (which is not much further) we feel worn out by day’s end. It’s another beautiful day walking right by the water the whole way. Dorchester has many really old buildings. We stay at the Fluer de Lys Inn, built in 1520. These really old places tend to be rather crooked; the floor level in our room varies by about 20 cm. Day 10, to Steatley. A long day of walking, with by far the worst weather of the trip. It rains heavily and consistently, the path gets muddy and then, unusually and unfortunately, the vegetation closes tightly in on the path. We get completely drenched pushing through it. The insides of my boots could not have been wetter if I’d walked in the river. We are so cold and uncomfortable when we reach Moulsford that we pike out and get a taxi the last few km to Streatley. Day 11, to Reading. After yesterday’s rain I fear we’ll be up to our knees in mud today, but it mostly isn’t bad. 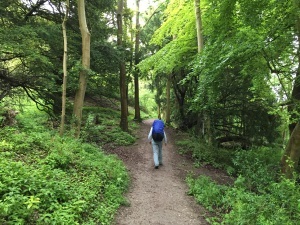 Near Whitchurch-on-Thames, the path goes up a hill and through a wood – one of the most beautiful stretches of the whole walk. The last part of today’s walk is into Reading, making it the least natural part of the walk. In Caversham (over the river from Reading) I visit the Fox and Hounds Hotel where, in April 1960, teenagers John Lennon and Paul McCartney played in public as a duo for the only time. This was well before the Beatles were playing regular gigs. 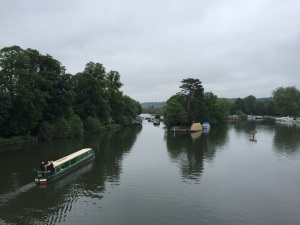 Day 12, to Henley-on-Thames. The river is very much wider than it was in the early days of our walk. The Saturday market is packing up when we make it into Henley. This market has been going since the 13th Century. Two other notable things about Henley are that it is world famous for its rowing regatta, and it’s where my grandfather lived up until 1910. He later took up rowing, and won the Kings Cup in the Western Australian crew of 1927. Day 13, to Marlow. I feel a bit melancholy knowing this is our last day. There is a lot more development along the bank today than we’ve previously seen. We’ve seen some pretty expensive houses along the way since about Abingdon, but today takes the cake. One place we get to walk through seems like it could be owned by a billionaire. Still, it’s a lovely walk. We celebrate the conclusion with a cup of tea in Marlow, and then get a ferry back to Henley where we’re staying. Overall, a wonderful experience. I hope we get an opportunity to do the rest of the walk into London at some stage. Posted on 13 June, 2016 by David Pannell. 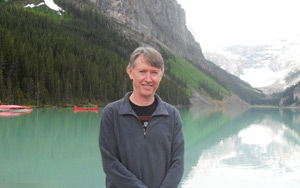 This entry was posted in Environment, Latest, Miscellaneous, Water. Great views. Great thing to do! Enjoy! Lovely, David. Thanks for this.